She is the only survivor in her cancer patient group of 10 people at the clinic. The doctors and nurses are proud of her accomplishment. When she offered to share with them how she did it, not one of them wanted to know! (If they found out then their oath would require them to share it with others. Since natural healing isn't accepted by the medical community they could then loose their license! Amazing.) So since they won't tell you, we will. Here is what she did. In April of 1996 our youngest daughter, age 30, was diagnosed with large cell immunoblastic lymphoma. She was a level 4 and given less than a 40% chance to survive five years. We prayed for God to intervene and to show us what to do. He led us to, nutrition and several natural health products. Our daughter has been cancer free since November of 1996, and since then we have been able to help several friends, family, and even strangers to overcome many health problems including different forms of cancer. We cannot make any health claims, but based on our own experience with our daughter, and based on several years of research this is a suggested formula for fighting cancer in any form. Those who followed this exactly are alive today and cancer free. First you need to eat a mostly raw food diet and Do Not Eat MEAT, WHITE SUGAR, WHITE FLOUR, MARGARINE, OR ANYTHING ARTIFICIAL. Meat produces an acid environment in your body and cancer cells thrive in this environment. Sugar shuts down your immune system, and Caffeine and any type of diet drinks or artificial sweeteners can cause serious health problems. When you eat meat and other cooked processed foods it takes over 70% of the energy derived from the nutrition of these foods to digest the food. Digesting food takes up so much energy from your body that there is not enough energy left for the body to take care of itself. Drugs and chemicals cannot heal. Only the Human Body is capable of healing itself, and it will if we provide it with the proper nutrition, and eliminate the things which poison it. Raw fresh food does not require much digestion and provides our body with the nutrition it needs to fight for itself. The best source of nutrition comes from vegetable juice and then from fresh fruits. Reserve the evening meal for your cooked meal with things like pasta, baked potatoes, green vegetables, corn, rice, and so on. This may seem extreme, but you are fighting for your life and it is not worth what we put in our mouth to destroy our body. You have to undo years of unknowing abuse. Barley juice is the most nutritiously, dense food in the world and will provide your body with the Vitamins, Minerals, Enzymes, Amino Acids, and Protein that your body needs to heal itself. One live enzyme called P4DI has been proven to eat the protective protein sheath off of cancer cells allowing your own white blood cells to destroy the cancer cells. Carrot juice contains beta-carotene plus alpha carotene, and both have been proven to enhance the immune system and protect DNA molecules from carcinogens (which cause cancer). It also fights free radicals and has antioxidant properties. Beet juice is a natural blood purifier, strengthens bone marrow, cleanses the lymph system, increases red blood cells, cleanses the liver, provides better assimilation of iron, improves the intestinal tract, and aids in tumor reduction. CoEnzyme Q-10 comes entirely from a plant source and is the spark plug of the cells increasing energy production by converting food into energy. It reduces recovery time, and strengthens the heart. This is very important with chemotherapy. The chemo pulls the Co Q-10 from the heart muscles causing it to become weak. Many survived the cancer and chemo only to have their heart fail later on because of the damage done to the heart. A combination of powerful anti-oxidants called OPC's and is derived from pine bark extract, grape seed extract, and green tea extract. It neutralizes free radicals that cause damage to the cells. It helps the immune system and green tea extract has been proven by MD Anderson Hospital in Houston, and findings have been released by the National Cancer Institute stating that Green Tea Extract kills cancer cells without harming the good cells. Fiber improves the function of the digestive system by reducing the transit time, and allows more assimilation of food. It not only reduces the risk of colon cancer, but we have learned that 90% of all diseases and all cancers come from a filthy colon. If the colon is not clean the body will reabsorb the toxins back into the blood stream and this causes cancer and other diseases. We have already mentioned that 80% of all our nutrition is absorbed through the colon walls making a clean colon very important in your fight. 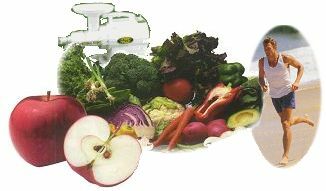 The raw vegetable juices that you are taking several times a day go directly to the cellular level when taken on an empty stomach and does not go through the digestive process. IT IS RECOMMENDED EVERY DAY you get some outside fresh air, a little morning sunshine, a 20 minute walk when energy permits, think about all the things in life that make you smile or happy, and THANK GOD FOR HEALING YOU. "Our daughter started out taking Chemo, but it was not long until her body started shutting down and Pat had really emphasized to pay attention to her body. She stopped the Chemo early, but continued the "natural" approach. She took two treatments before she started the "program" using nutrition and her side-effects were horrible and she even had to be hospitalized. After she started the program all side effects subsided and her blood count stayed up."